Hot Tip: All Natural Meat for Cheap or Even FREE! Anyway, I’ve been harping for the last several weeks about getting your meat reserves up as soon as you can. Unfortunately, nothing’s changed in the outlook in that regard. I specifically am watching the beef industry and I’m still expecting to see it increase to several times it is now per pound. Funny thing is, though, that just as I was wondering how I was going to kick up my own meat purchases for preservation, I was introduced to a great solution. Zaycon Foods. Zaycon Foods reminds me of Bountiful Baskets except that they deal exclusively in proteins such as turkey, fish, chicken, beef, bacon, etc. 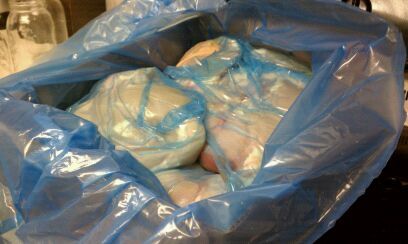 For example, this past month they offered a 40 pound case of boneless, skinless chicken breasts. The month before it was big beautiful bacon. You’re given an assigned location to pick up your case of protein. You drive in, show them your slip, and they load it in your car for you. Now that’s service! When I got my box I was surprised to see the hefty box they came in, clearly in an earnest effort to keep them cold. 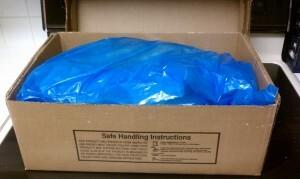 Inside the box was a big plastic blue bag which held the massive chicken breasts. I just can’t even begin to describe how amazed I was at the size, the fresh smell, and the condition. I almost didn’t want to can them all! I gave in and kept one half of one out so that I could make the homemade Chicken Parmigianino. Granted, I pride myself on being a good cook. But frankly, this was the first time I’ve ever made the famous chicken dish. I’ve always been concerned that it would be too dried out by the time I was done cooking it. But this dish turned out absolutely perfect. Juicy, plump, and fabulous! breasts was at a store called “Buy Low” that is famous for it Friday and Saturday sales on meats. The last time I purchased from them, though, I brought the chicken home to can and it just didn’t smell right. In fact, it smelled a bit rank while it was in the pressure canner. Yup, learned my lesson well. Frankly, this understanding of “end of life” foods that are sold make me leery of so-called “great deals.” Then of course there’s the unfortunate industry practice I discovered of pumping the chicken and beef pieces full of water. 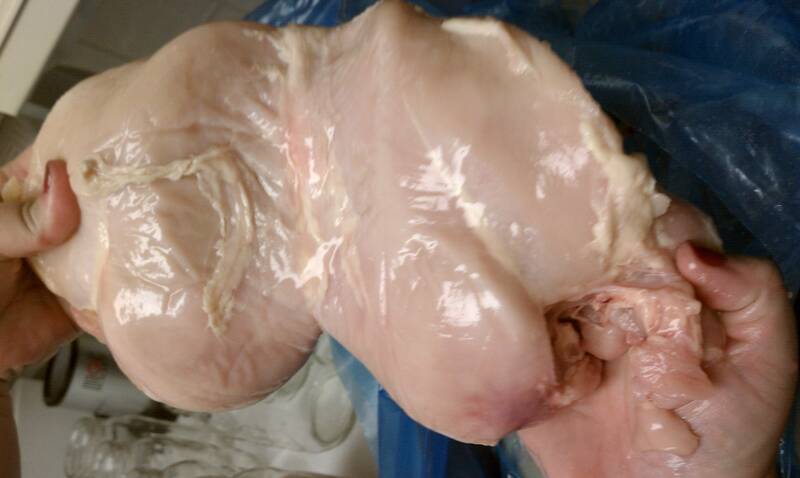 You might get a great deal on the meat but you’re paying for water that's pumped into your meat. All of these considerations make me that much more pleased to find a good solution for acquiring sufficient supplies of meat without having to settle for polluted, hormone ridden, “end of life” garbage. Here’s how YOU benefit from Zaycon Foods. First of all, you register at their website here. Then you wait for them to send you the announcement of their next meat event and when you receive that announcement in your in-box, hurry and order all that you want before it’s sold out! And guess what? There’s no limit to how much you can get! I was so psyched with the results from the last box of meat, I had to go and do it all over again! I’m convinced that I will continue to do so as long as they keep throwing these aggressive price cuts at me. Zaycon Foods is all over the U.S. but that’s not to say that they have made it to a city near you just yet. But don’t worry. If they haven’t, it’s quite easy to MAKE them come to you. *grin* All they need is 100 people registered in an area and they actually award you for referring people to their site in the form of $1 for every time someone you refer to the program makes a purchase. Hmmm… we might just be talking about great meat for FREE if you’ve got enough friends who participate in the program. While that's a worthwhile goal, I'm happy that with only a little bit of "shouting from the rooftops" I managed to get my cost per pound down to about $1 due to the referral bonuses. Pretty sweet, eh? Once you register, they will give you a referral number and a link you can use to refer other folks. When other people register using your number you will get a nice thank you note from Zaycon Foods. You can always check out who’s registered by going into “My Referrals” on ZayconFoods.com Again, you get the $1 credit for every time they order one of the special events, not just the first time. They do this instead of spending even one penny on advertising. Pretty cool, huh? So at the very least, you need to register with them here simply by entering your information, including your e-mail address. I can assure you from experience that it’s not difficult to spread the word about these great deals. And if you'd like my help with getting them to a particular city, let me know. I'd be happy to spread the word for you on my Facebook group pages. Whether a person is well off or struggling financially, we can all use a little pressure release on our wallets and this is one find that I’m happy to shout about from the rooftops. P.S.--I just received my Zaycon e-mail announcing their newest event--97/13 ground beef, again it's all natural folks. I just took a gander at the last pound of ground beef we purchased. (My husband does that when he's cooking instead of using my canned meat--haven't figured out why yet.) Anyway, we bought 85/15 for $3.99 a pound. 97/13 is usually about 20% higher and that's when it comes from "who knows where" with cattle that are raised under "who knows what" kind of conditions. So, yes, this is a very good deal on meat that you'd pay nearly $6 a pound for in terms of quality elsewhere. You can bet I'm going to take advantage of this month's deal and I LOVE the taste of my canned ground beef! Remember too that if you keep referring people to Zaycon, then you could end up getting these great meats like this for a song! (Yes, I'm sure a kazoo will be fine for you non-singers out there.) So again, here's the link to enroll. Remember, you're only enrolling to get notified of the sales event in your area-not making a purchasing commitment. This is so exciting! I was thrilled to know that Zaycon will have events only about an hour or so from me! Alas, each event has been sold out. Signed up so I hope to get future notices so I can take advantage of these great deals. Budgeting for the meat and for more canning jars too. Thanks Kellene! Sharon, you can find LOTS of jars at Goodwill and other similar thrift stores as well as in your local classifieds. You'll get them for less than a song that way. We just signed up and will pick up our order on Tuesday. It was exciting to find out an event is taking place next week and just a few miles from where we live. Thanks for helping us save some money on our food budget. 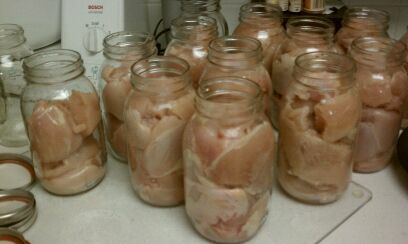 Because of your help and encouragement, we have already mastered canning meat with a pressure cooker, so we are all set. Home canned meat is so easy and delicious! Thanks, Kellene for all you do. I'm excited too! I just figured out that with the little bit of savings I get on the meat with referrals, I can actually afford to feed my pets homemade quality foods everysingle meal AND save over $1,200 a year doing so! So the next event, I'll be stocking up on whatever protein they give me. Even with using coupons, this makes my protein costs significantly cheaper than the questionable stuff I get in the wet food even though I buy premium each time. I LOVE saving money--especially when it's on great stuff! They deal mostly in proteins (which are always great!) but this past summer they had some incredible deals on fruit as well! It was limited to the geographic areas where they had suppliers of high quality fruit. We purchased peaches that were the absolute best I have ever had in bulk and far superior to anything in the stores.. Their fruit was all organic process/no spray fruit at great prices. I have been purchasing large quantities of fruit from local farms under contract for many years but I was blown away by the Zaycon quality! This sounds awesome. Unfortunately I live in NYC and they don't service here. NYC nevers gets anything actually, long term food storage items is difficult, coupon sales often specifically don't apply to NYC stores, we always get the shrift. Once you register on the link that I shared in article, I'll go ahead and help promote it for you. OK? I'm sure it will be simple to get going in your area! Kellene - I looked for info on how this meat is different from the conventionally raised meats in the grocery store but didn't find any information. I understand that Zayco's product will likely be fresher and that the chicken will not be injected with high amounts of salt water. I didn't find much that states they raises the product any different than they do most meats. There is a comment that they test for anti-biotics or hormones as required by USDA - that implies to me that the meat does not have those yucky items at the time of slaughter but doesn't lead me to believe those chemicals aren't used at some point along the way. It's right there on their site. It's also in their sales event e-mail messages. In addition, as with all of the articles I write, I also interviewed members of their staff. Also "they" do not raise the meats. "They" work with producers that are local to the sales events. Kellene, thank you for this information. I just went and signed up at both Zaycon and Bountiful Baskets. I'd never heard of them before.